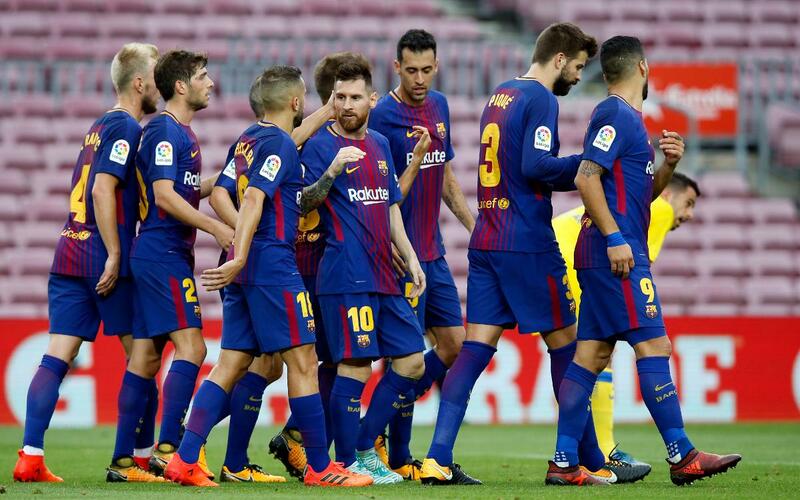 In what has to be one of the strangest atmospheres that any FC Barcelona or Las Palmas players have ever experienced, the hosts continued their perfect run in La Liga with a 3-0 victory at a virtually empty Camp Nou, a win which also gave Barça their 1,000th clean sheet in La Liga. Every shout and strike of the ball could be heard as the Blaugrana took the game to their opponents from the first whistle. Most of the action was concentrated at the visitor’s end of the pitch with Sergi Roberto going close and Luis Suárez flagged for offside before the 10-minute mark. Lionel Messi saw a superbly flighted free-kick saved by Chichizola as Barça continued to pile on the pressure, the Canary Islanders only getting out of their half sporadically. A typical Paulinho run into the box almost saw the Brazilian open the scoring just after the half hour, but his header drifted agonisingly wide. When Las Palmas did threaten on the counter attack, Barça’s defence and Marc-André ter Stegen were up to the task, the post saving them when the keeper was beaten just before the break. Chichizola kept out another Messi free-kick at the beginning of the second half and within two minutes had to push a venomous Ivan Rakitić shot over the bar. From the resulting corner, Sergio Busquets scored his first of the season with a perfect near post header. Andrés Iniesta, a half-time substitute but who was forced off late in the game, injected some urgency into Barça’s play as they continued to probe for a second goal. Pako Ayestarán’s side battled gamely but the intensity of the Blaugrana’s pressing game restricted the visitors to shots from distance that didn’t trouble ter Stegen. With 20 minutes to play, an inch-perfect Denis Suárez ball found Messi unmarked in the area, and Barça’s No.10 made no mistake, taking the ball around the exposed Chichizola. The Argentinian would double his tally a few minutes after, latching onto Luis Suárez’s assist to complete the scoring. La Liga now takes a break for international games with Barça back in action on Saturday, October 14, against Atlético Madrid at the Wanda Metropolitano (8.45pm CET).